thanks a lot, dear Nanet !! So far, what's the best present you've received? Hyung Joon : Fan's feelings and inner thoughts. Always being around us and giving us support is the best. Jung Min : Whatever is good. Giving me things I've thought of. Kyu Jong : A photo album made from all the SS501 activities from Deja Vu onwards. Young Saeng : Nice shoes, nice bag, nice clothes, nice jewelry. 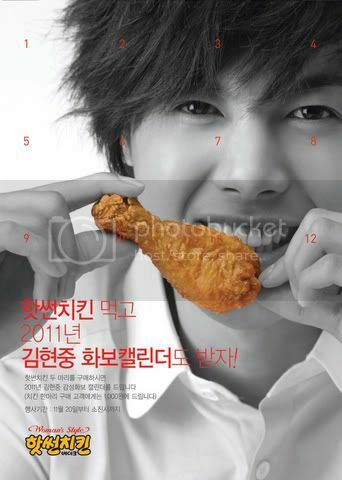 Hyun Joong : Chicken leg. Hahaha don't you just love the way Hyun Joong spontaneously answered!!! That's my 4D little urchin boy ^^ ... Yep, Chicken Legs are delicious....in fact, if I go to the finger lickin' good resto...I'd order that part of the avian creature. The present from fans that made a great impression on him...the most memorable one... is...Chicken Leg !! Why did he say that ? maybe because he was very very hungry at that time, and the chicken leg came just at the right moment ?? ?...or he was dreaming and craving for some chicken legs and lo and behold....a batch of chicken legs came from fans....or while he was wishing for some...a fan shared one of the chicken legs on her plate with him ?? Photo Credit : Hotsun Chicken calendar.